If you want to bring in more visitors, leads, and sales, then this will be the most important audiobook you ever listen too. If you need more visitors, leads, and sales for your business, then you know that Facebook Advertising is the number one go-to for all business owners right now. It's the cheapest advertising out right now and it gives you the absolute best bang for your buck when done right. So what I decided to do, is reveal all of our methods to crushing Facebook Ads for our multitudes of clients and our own campaigns. Best of all, we're only charging $1.99 to get access to this audiobook, simply because, once you get these methods, you're either going to want more trainings from us, or you will want to become a client. The 9 Audiences you need to setup before you launch any campaign online. These audiences are a must-have and position your Ads Campaigns for success right out of the gate. The 2 main Campaigns we setup for every single client we take on. We walk you through our initial setup, the audiences we test, how many ads, the copy, literally everything we do for our $3,500 a month Facebook Ads Clients. The one ads placement you do not want to target at all. If you target here, be prepared to lose money and simply kill your campaigns. How we create easy 15 Second Video Ads that get 3% Click-Through Rates and will cut your Lead Cost in half. We launch all of our clients with these ads and generally cut their lead cost by 40-60% depending on what they were paying before. The free software we use to edit all of our image ads which make them pop out of the newsfeed, which allows you to get cheaper clicks immediately. How to track every single click, lead, and sale. This is simple, but often overlooked and you need to do this if you ever want to truly scale your campaigns to $100k a month. The Ad Copy Formula my team uses to launch winning ad, after winning ad each time. If you want the most bang for your buck, you need to be testing these two specific copy formulas, if not, you're leaving $ on the table. Our Retargeting Strategies that bring in more sales for any advertiser. We have 3 specific campaigns that we run for ourselves, and our clients, and if you want to hit your prospects from all angles in order to convert them, you need to make sure you have these in your arsenal. How to look at the data so you know when to scale and when to cut your losses. This is tested across Millions of Dollars in ad spend and will allow you and your team to get to the next level. The Specific Lookalikes Audiences we test immediately after we get some data. You need to make sure you're making LLAs based off these audiences, they will be some of your best campaigns. The exact sequence we took people through. We go over the flow, the ads, and the why. The specific custom conversions we setup to track best campaigns, which also allowed us to create custom audiences of our most pre-sold prospects as well. How we get Testimonial Videos from our best clients so we can get prospects off the fence who are thinking about buying our programs. What software we used to segment our best prospects depending on how long they had watched,and the emails we sent them to convert the sale. The simple one line of text we added to our thank you page that 4x our booked calls revenue. Once you add this to your campaigns, you'll see immediate ROI. I reveal how much we paid for a booked call, what a booked call was worth to us, and how we tracked everything. The "Sweep Up" Campaign we ran 45 days after someone opted in that brought in 30% of our revenue. If you're currently running a webinar and not running this, you're INSANE. 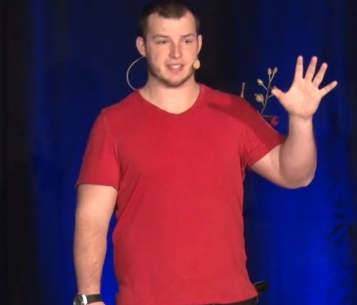 I guarantee you're going to absolutely love this Live Training or you will get 100% of your money back, plus you can keep the replay for FREE. These tactics are battle tested across $250,000 a month of ad spend and are working for a ton of clients and our company. Want to get instant access to these strategies and tactics right now? This audiobook is just $1.99 and I actually lose money on every single sale I make on this. Why would I offer an insane deal like this then? My hope is, you grab the audiobook, consume the information, and then buy one of our higher end programs or simply become a client of ours so we can scale your company with Facebook Ads. This Is For People Who Want More Leads and Sales From Facebook. At the start of the audiobook we focus on the basics and how to get started and then we get into the more advanced stuff that will help you scale. If you're just getting started out this will help you get a great base to leverage and actually get results fast. If you're an intermediate advertiser or even a pro, we go over some of our advanced strategies to squeeze even more profit out of every campaign we launch. Facebook Ads have allowed us to get up to 719.71% Return on one of our clients ad spend. Finally they allow us to keep our calendar completely full with new booked calls every single day. Last month this campaign brought in 677 Booked Calls for our Agency at $15.66 each. There's no secret trial we're adding you to here, it's simply $1.99 to get in. We know that if you actually implement what we tell you too in this audiobook, you're going to bring in more Leads and Sales from Facebook. Then you're going to want more products and services from us. We're here to give first, and then receive later, as long as we deliver. If for whatever reason you don't like the audiobook, we'll refund you your $1.99 and you can keep the audiobook for free. Just email or call us and you'll get the money refunded right back to your card - no questions asked. Click on the button below, you'll be taken to our checkout page where you'll be able to order our audiobook for just $1.99. You'll get instant access and will be able to start bringing in more leads and sales for your business via Facebook Ads this week. So click the button below and I'll see you inside.